The historically famous town Arani (Tamil: ஆரணி which is written as Arnee, Arani or Arni) is on the banks of Kamandala Naaga river, in Tiruvannamalai district of Tamil Nadu. The town is around 38 kilometers from Vellore and 60 kilometers from Tiruvannamalai. There are three variations given for the town being called Arani. Aar means Athi [fig] tree in Tamil. Since there were lots of such trees in the area this place got the name Arani. Secondly it got its name from Sanskrit word Aranyam [means forest]. [Interestingly the nearby place Arcot also derived the name from [Aar] Athi tree and kadu [forest]]. Thirdly since the river Kamandala Naaga River [river is Aru [ஆறு] in Tamil] flows through the place, it was called ARaNi [ஆறு + அணி] in due course it became AraNi [ஆரணி]. The river Kamandala originates from Javathu Hills and Naaga River originates from Amarthi hills near Kannamangalam and both these rivers amalgamate in Samburayarnallur near Arani and flows through Arani. The Arni Jagir dates back to 1640 when its founder Vedaji Bhaskar Pant was granted the Arni Jagir from the great Maratha leader Shahjee (father of Shivaji) for services in war rendered in his campaign to the Carnatic. The Jagirdars of Arni were from Maratha Brahmins and followers of Dwaita philosophy professed by Sri Madhwacharya and ardent follower of Madhwa sampradaya. The Jagir continued to be headed by the descendents Sri Bhaskar Pant till the Zamindari Abolition Bill was passed in 1948. The tradition had that the Jairdar’s were named either as Srinivas Rao Saheb or Tirumala Rao Saheb. Sri Vyasaraja Teertha (1460-1539), the great saint and follower of Sri Madwa's Dvaita School of philosophy had built around 732 Hanuman temples spreading all over south. One such temple is located around ten kilometers from Arni. This holy place use to be visited by many Madwa saints of that time. Today this place is known as Sri Sathya Vijaya Nagaram, named after another great Madwa saint. The biography of the saint who gave his name for this holy place will tell us the importance of Sri Hanuman which was installed by Sri Vyasaraja. Sri Sathyapoorna Teertha pontiff of Sri Uttaradi Mutt gave ashrama to Sri Sathyapriya Teertha who went on pilgrimage to north India. After years when Sri Sathyapoorna Teertha felt that he had to leave his mortal coils and leave for the heavenly abode, he could not locate Sri Sathyapriya Teertha. Therefore he located Sri Balacharya of Mannargudi suitable for the handing over the Mutt. Accordingly he was initiated into sanyasa as Sri Sathyavijaya Teertha and with specific instructions that he would handover the Mutt to Sri Sathyapriya Teertha on his return from the pilgrimage. Few days hence Sri Sathyapoorna Teertha entered brindavan. Since Sri Sathyapriya Teertha did not turn up, Sri Sathyavijaya Teertha continued as head of Sri Uttaradi Mutt. During the course of his vijaya yatra he came to Arani. Arani during that time was under the Jagirdar who were ardent followers of Madwa philosophy. Arni Jagir felt that they were honored by the visit of the Guru and made all arrangement for them for peaceful conduction of pooja. One day after the pooja Teertharu took Jagirdar for a stroll. At one place they saw a snake [Sri Nagaraja] and Jagirdar wanted to know the significance of this. Srigalu told him that a war is ensuing and he may have to shift his place of residence. After some time Sri Sathyavijaya Teertha felt that his end was nearing but could not locate the whereabouts of Sri Sathyapriya Teertha. He called the Jagirdar and instructed him that his Brindavan will be built when the pall bearers can no more bear the weight. Further he made the inventory of all the things with him and gave a copy to the Jagirdar and one more for Sri Sathyapriya Teertha. He had also instructed that the pooja box should be buried after his entrance into Brindavan and has to be unearthed only by Sri Sathyapriya Teertha. Further he instructed that Sri Sathyapriya Teertha has to exchange his danda. On Chaitra Krishna Ekadashi, Sri Sathyavijaya Teertha passed away and as instructed they started carrying him. When they came to the very spot where the snake was sighted [which was known only to the Jagirdar and Srigalu], the pall bearers were unable to bear the weight and stopped. Jagirdar built the brindavan for Sri Sathya Vijaya Teertha and also shifted his palace to the near by place. He renamed the place as Sri Sathya Vijaya Nagaram in the memory of Sri Swami. Sri Sathyapriya Teertha came to Sathyavijaya Nagaram and was briefed by the Jagirdar about the happenings. The Pooja box was taken out and given to Sri Sathyapriyaru. All went on well until the Jagirdar informed the Swamiji that he has to exchange his danda. Now this created a peculiar problem. Sri Sathyavijayaru was not his ashrama guru and it is a normal practice to receive the danda from the ashrama guru only and more over he was senior to Sri Sathyavijaya Teertharu in sanyasarama. Confused and hesitant he started walking out of Sri Sathyavijaya Nagaram in dilemma. Sri Sathyapriya Teertharu reached the Sri Mukya Prana [Hanuman] temple at end of the village which was consecrated by Sri Vyasaraja. The moment he reached the temple he was swarmed by monkeys and stopped him from proceeding further. Srigalu returned and looks for the pooja box which became invisible to him. It was then he realised the greatness of Sri Sathyavijaya Teertha and composed the famous sloka “Sri Sathya Vijayaru” in praise of Sri Sathyavijaya Teertharu. Sri Sathyapriya understood the significance and exchanged the danda with Sri Sathyavijaya Teertha and continued his journey. The temple of Sri Mukya Prana [Sri Hanuman] is in the beginning of the SV Nagaram as one takes the bus from Arani. The Brindavan of Sri Guru is about one km from this temple. The temple had been renovated recently by Sri Uttaradi Mutt. Sri Hanuman blesses the devotee moment he enters the temple. Sri Hanuman of this kshetra is a yathurmuki i.e., he is facing the devotees directly with both the eyes. The tail of Lord is seen raised above His head. Lords' left hand is seen resting on the left thigh and holding the lotus flower. His right hand is in abhya mudra offering the quality of nirbhayathvam to all His devotees. Lords ears are adorned with Kundalam. While Lord is seen with all ornaments the locket of the mala the Lord is wearing has Sri Rama, Sita and Lakshmana which only adds beauty to the Lord. Sathyavijaya Nagaram is a village on the banks of Kamandala Naaga River in Arani Taluk, Thiruvannamalai District, and Tamilnadu. It is about 10 km from Arani. The Moola Brindavan of Sri Sathyavijaya Teertha is situated here on the banks of Kamandala Naaga River. The village had been named by the Arani Jagir as Sathya Vijaya Nagaram after the great Guru, popularly now known as SV Nagaram or Nagaram in Vellore district. The village was once flourishing with activity, learned scholars of Dvitha philosophy were settled here under the patronage of Jagirdars of Arani. But today it is different, even the palace of the Jagir of Arani is in ruins, but the Brindavan of Sri Guru is active. The descendents of Jagirdar of Arani and other ardent devotees keep visiting this holy place seeking the blessings of Sri Sathyavijaya Teertha and Sri Veera Anjaneya Swami. The Brindavan is under the administrative control of Sri Uttaradi Mutt and is positioned amidst serene nature away from the crowd and commercialism of habitation. The place reverberates with positive vibrations pertinent for spiritual upliftment and helps forget the mundane issues of life. This village also houses the palace of the then Jagirdar of Arani, who were ardent followers of Madhwa philosophy. 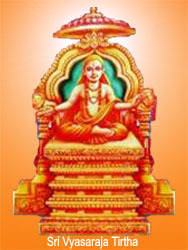 The Brindavan of Sri Sathyavijaya Teertharu was taken care by the Jagirdars of Arani, but after abolishment of Zamindari [Jagirdari] the administrative control had passed over to Sri Uttaradi Mutt. Presently there is provision for the devotees to come and stay in the mutt at this village. The devotees can avail these facilities, feel the presence of the Srigalu at this place and have dharshan of Sri Vyasa pradeshta Prana Devaru - Sri Hanuman. Take the double benefit of being blessed by Sri Sathyavijaya Teertharu and Sri Vyasaraja pradeshta Sri Veera Anjaneya Swami – Sri Mukya Prana Devaru of the holy kshetra. The visit to this holy place is bound to bring ‘Santham’ in one’s life.